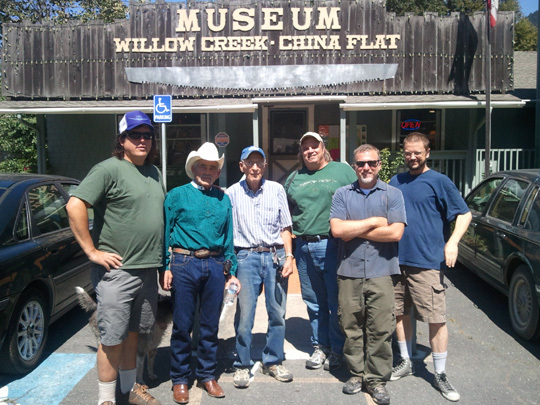 Rogues Gallery at the Museum: James "Bobo" Fay, Bob Gimlin, Al Hodgson, Tom Yamarone, Cliff Barackman and Steven Streufert. Photo snapped by a crew member whose name we didn't catch. Steven Streufert appeared on last sundays Finding Bigfoot Episode. He is the owner of Bigfoot Books and the editor of BIGFOOT'S bLOG. We are big fans of his blog and have huge respect for his "tell-it-like-it-is" style (see Bigfoot Wars Pt. II). Below is a short excerpt from his experience. His post sheds some light on what we had wished they would have spent more time on in the episode. After the excerpt jump to his post! And, by the way, we have REDISCOVERED the PATTERSON-GIMLIN FILM SITE, or so it seems, and we have documented it. Yes, that means we have found the big trees and the stumps, and will almost certainly be able to re-trace the creature's track-way as in the film. That news is going to be coming out slowly here on this blog. I've also been posting on the MUNNS REPORT thread on the BIGFOOT FORUMS. It looks absolutely certain, to me anyway, that we have indeed found the site. So, stay tuned for yet more BLUFF CREEK FILM SITE PROJECT. (See under "Favorites" through this link.) It should be said here and now that the film crew were on the right spot, as identified by Bob Gimlin, but the recreation shown in the show was done down on the gravel bar edge of the creek for better filming. The ACTUAL film site is back on the elevated sand bar BEHIND where you see Bobo walking. That is not the true track-way of the creature seen in the PGF. The question is not how long the species has been around but how old and big the oldest one is. So be careful out there! A nice big bag of roasted peanuts in a twenty pound bag placed out where the creatures of the forest can lay eyes on it is your best bet. Then let them follow the leader to a feast. I came face to face with a Bigfoot in New Milford, Pa. He did not try to harm me in any way. I was pitching a fit not knowing what to expect but honestly I can say that if I met the creature again, I would not have been in a tizzy. I saw curiosity in the eyes, not hostility. Oh well, I blew my chance to make friends and keep it alive. I hope you do better than I did. If he is still there, I don't know. I moved from Pa. The place was Tingley Lake Road and he had been eating wild blueberries. The pink house with an elderly lady living alone near by was at that time, no threat. She heard the cries of the creature at night. She said she wasn't moving because of that, she was too old. Finding Bigfoot episode bigfoot crossing in Georgia 2011. This Matt Moneymaker, odd name to have by the way, explains the dimensions of a typical bigfoot as having a large long torso or upper body and shorter legs in comparison to a human. Taking what Moneymaker says and popular belief that bigfoot, if it exists and theories are correct, they are large, considerably tall, big feet, and leave large prints which are farther apart than a humans tracks. Meaning they take long strides. Now I'm no scientist or doctor, I'm a regular dude, but if something has short legs how in the world could it take long strides based on what Moneymaker says. I am a believer and a skeptic, it would be amazing if this creature is discovered to exist. I do want to believe in some areas of the world that Bigfoot could dwell, but Moneymaker says makes no sense. It's like if one were to walk on their knees could you take large strides. No. No way. It's physical stature could not be what Matty boy thinks. It's absurd. I watch the show, I watch many shows pertaining to bigfoot, my favorite being Monsterquest, rest in peace, but the garble coming out of Moneymakers mouth is so contradictive to any possible accurate theory of physicality of elusive bigfoot. Who else out there thinks Moneymaker is a tool and a crappy storyteller? I'll keep trying to believe as along as theory makes sense. Shorter legs in proportion to the rest of its body,not shorter than a humans. Michael Merchant has said at one point it is likely there are more than one species. Some are not going to be tall. Some are not going to have long legs or big feet. If we just go by humans, we are from 23 inches to 8 feet 11 inches and weigh up to 1600 pounds. It is like canis lupus [including dogs], which has individuals from eight ounces to 240 pounds. I have a 36 inch inseam. At a very fast walk or a run, I stretch out to 40 plus inches easily. I am 6'4". I am long legged for a human. However, if I were over seven foot, even a 40 inch inseam would be short and I would have a long trunk. So, the seeming contradictions between a long stride and the "dimensions of a typical bigfoot as having a large long torso or upper body and shorter legs in comparison to a human," do not exist in fact. In comparison with humans, I am sure several ratios of torso to appendage sizes differ. Hello my name is Dennis Daryl Shamblin. Please read my new novel Surviving Bigfoot and the Dixie Mafia. The book is available through Amazon. I agree with Catherine Reynolds Bigfoots relish the taste of peanuts, that is one reason why they hung out near our peanut farms. Go to Sams Club and purchase two or three of their large peanut butters and spread it on the trunks of trees.